Adenomyosis is a condition in which part of the endometrium, or the lining of the uterus, becomes implanted in the muscle wall. This results in small pockets of bleeding within the muscle at period time, resulting in painful periods that may also be heavy. Ongoing pelvic pain between periods and spotting is also possible.Adenomyosis may occur diffusely throughout all or part of the uterine muscle(so-called diffuse adenomyosis) or maybe more focal resulting in a localised adenomyoma. Adenomyosis often occurs in association with uterine fibroids and both appear to grow in response to oestrogen. Diagnosis of adenomyosis can be difficult on ultrasound alone and it is often only picked up on MRI scanning. 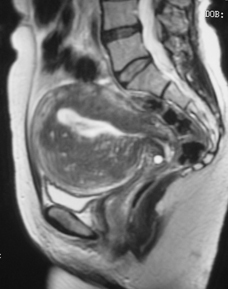 It is not unusual for patients referred with a diagnosis of uterine fibroids to be found to have coexisting adenomyosis when an MRI scan is performed. A small number of patients referred for treatment of uterine fibroids are found to have pure adenomyosis on MRI scanning and do not in fact have fibroids at all. Adenomyosis is most common in women between the ages of 35 and 50 and is also more common in women who have been pregnant or who have had Caesarean deliveries. The treatment of adenomyosis has traditionally been by either hormonal drug treatment or by hysterectomy surgery. It can now, however, also be treated by uterine artery embolisation (UAE). NICE, the National Institute for Clinical Excellence, that issues guidance for NHS treatment in the United Kingdom has issued guidance on the use of uterine artery embolisation for adenomyosis. 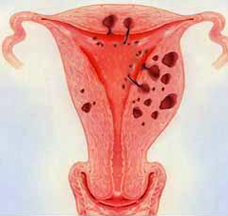 In uterine artery embolisation for adenomyosis the procedure is essentially the same as at that for uterine fibroids. When embolisation is being performed for adenomyosis it is usual to use a slightly smaller particle size for the embolisation as this has been shown to give a better result. There is a higher recurrence rate of adenomyosis post embolisation than is the case with uterine fibroids and it is occasionally necessary to repeat the embolisation procedure a few years down the line. For women closer to menopause, however, this is not usually a problem. MRI guided focused ultrasound (MRgFUS) has been used to treat adenomyosis when it forms a localised mass or adenomyoma rather than the more diffuse form of adenomyosis that is scattered throughout the uterine wall. Like other centres, however, we have found the long-term outcomes disappointing with a high rate of recurrence and no longer offer MRgFUS for adenomyosis.